Wrightsville Beach & Figure Eight Island Fishing Report 5/3 "Another Inshore Grand Slam"
Had another Great Day Fishing Wrightsville Beach & Figure Eight Island adding another “Inshore Grand Slam” to the books! 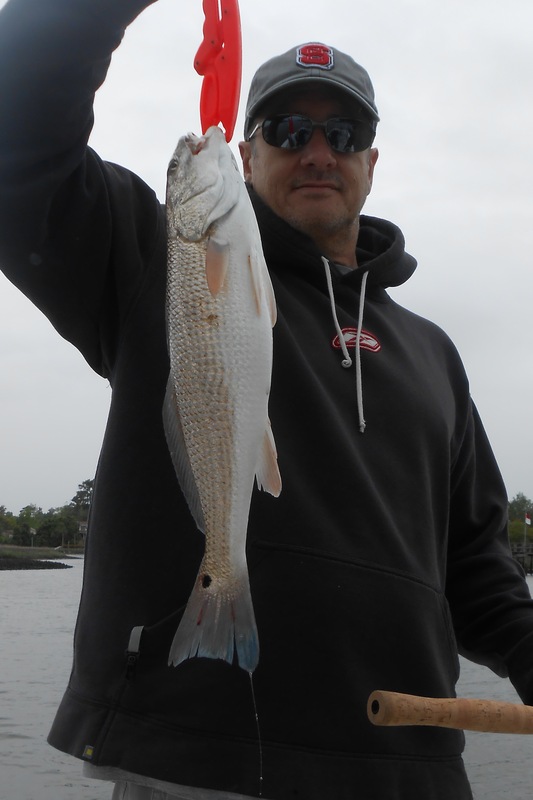 Spring Fishing: When fishing in the Spring you must consider one thing… Inconsistent Weather! The forecast for 5/3 was clear to partly cloudy skies with a NW wind 10 – 20kt. Well, it was half right! Wind was 10 – 20 kt; however, the blinding rain was the surprise today. 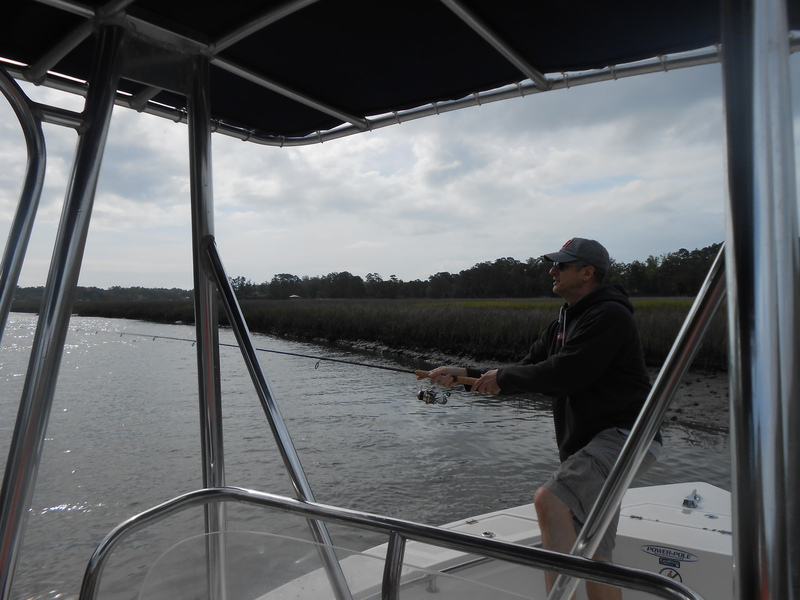 We decided to push North of Wrightsville Beach and Fish behind Figure Eight Island today… It was a good choice! Figure Eight Island boasts some of the cleanest and pristine waters in coastal North Carolina providing Excellent Backwater Fishing and Wildlife Viewing Opportunities! Keying in on the Marshes, Docks and Tidal flats, we managed to catch Flounder, Red Drum, Speckled Trout & some decent Bluefish. The trick for days like today… Either Fish Protected Leeward areas or Fish the “45 Degree Angle Approach” that will allow you to present your baits to the fish in the most natural way possible and that will enable you to stay in that “strike zone” for the fish you are targeting. 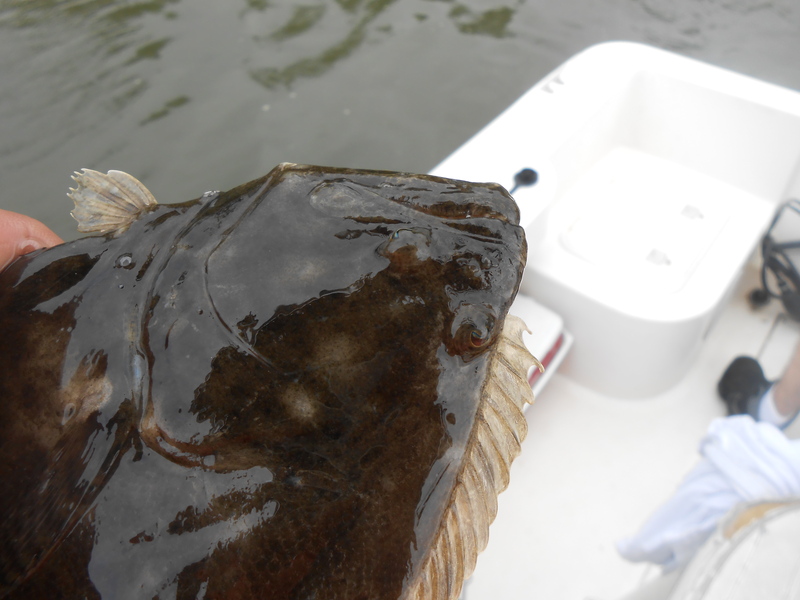 “45 Degree Angle Approach”: When you are Flounder Fishing and NEED your baits to stay in relatively consistent and close contact with the bottom, it is difficult to achieve this when you are casting with the wind at your back and with the current flowing away from you (a 20kt wind blowing in the direction of the tide will suspend a 3/16 oz jig out of the preferred strike zone). Solution: Position yourself so you are casting at a 45 degree angle to the wind and current direction (position the front your boat perpendicular to the wind and current… I use a combination of the Power Pole on the stern and Anchor off the bow to achieve the optimal angle). Cast your bait “up wind & up current” and let the tide and wind move your bait down the desired strike zone “sweep” (fishing from left to right or right to left). This angled approach to fishing the conditions take some time to get use to as you are fishing a ” “Sweep”. What is fishing the “sweep”… A sweep is when you fish an area from 3 o’clock to 9 o’clock as opposed to the normal 12 o’clock to 6 o’clock. When fishing the sweep, you only need to provide the bouncing action of the jighead and reel up the slack in the line as you will not be physically reeling in your bait: instead, allowing for the current and wind to dictate you presentation speed. To adjust your “drift” presentation speed you can either bump your jighead weight up or down. The choice baits presented today under the overcast and rainy conditions were Black DOA jigheads, Green Blue Water Candy Jigheads (varying weights depending on desired “drift speed” & Grey Pepper Flake Grubs (Scented with Pro-Cure Mullet & Shrimp Scent). If its cloudy, rainy or low light conditions… always go DARKER. All of our fish were caught in the deeper waters (4 – 12 feet) today as the front and dropping barometric pressure pushed them out of the shallow water areas. 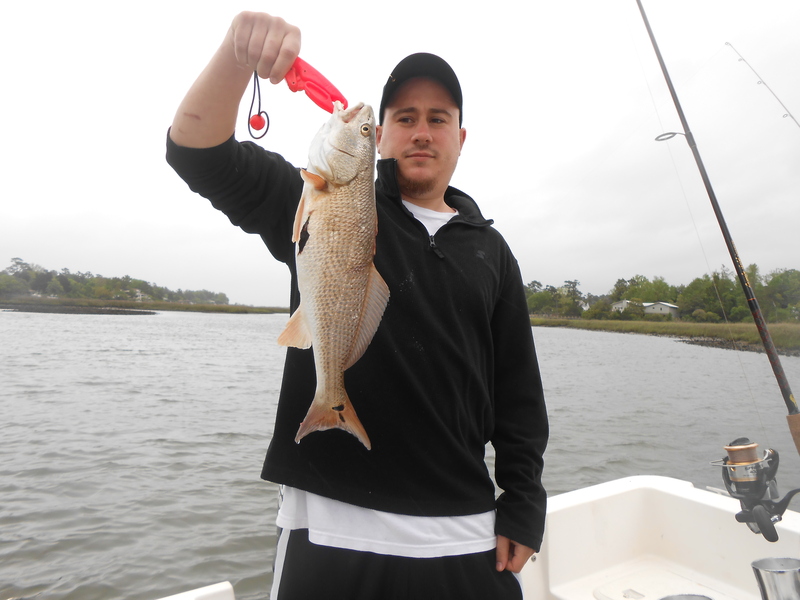 This entry was posted in Fishing Reports, ProFishNC News, Uncategorized on May 4, 2013 by admin.